To capture the attention of the people to come to your table or booth, it is very important to display banners or images of some of your pieces in the walls of your booth. They have to be big enough for people to see them from far away. It is important to make banners or posters with one piece or a small set of pieces per poster or banners. Do not over fill the banners with lots of pieces because it will be overwhelming and they will not bring people to your booth. Try to avoid adding your name in the banners because when you have to apply for some juried shows, they cannot see your name in the booth shot you will be sending in your application. It is better to make a single banner with your name and take it out of the picture when you submit for art show. Keep your jewelry displays neutral and very clean looking, we want the jewelry to be the star and not the displays. Lighting is very important to be able to display and show your jewelry. If you have access to electricity in your shows you have to think in bringing good lighting for jewelry. This is going to make your jewelry pop-up and showed the details much better. Be careful to not blind your customers with the lights, check the displays and be sure the lighting is correct. 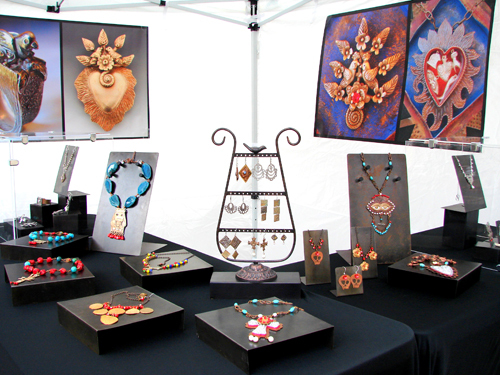 You must present your jewelry to your clients when they buy your work in the best possible way you can. Spending money in buying good jewelry boxes is totally worth it and there are lots of options to buy boxes that are cheaper but look very expensive. You created your work with love and you must give it away in the same way. You have to show respect for your craft and your client. Make the boxes more personal by adding your name or logo on the top and if it is possible, write a small bio for the inside. They love to have more information about the artist who made the piece. And last but not least,SMILE and have a GOOD attitude. You are representing your work and no matter how tired you are, if the show is not very good, if you are not selling a lot; you always have to keep you beautiful smile and be nice and friendly to everyone. Your attitude is an important factor in how much you can sell and if the customers will be remembering you. Please, do not eat in front of the customers and stay sitting in a chair. You have to have direct eye contact with your customers and sitting in a chair is not going to make that possible. You also have to dress nicely. I have seen a lot of incredible artists who do not take care on how they look and that is not going to give a nice impression to your future clients. Here you have some links where you can find banners and jewelry boxes. I get my jewelry boxes at NOBLE. Really great tips! Your booth is beautiful! Great advice! I love your display. Each piece is a work of art and your display and packaging reflects that. Lorena, you make a very good point. I once splurged and bought myself a very beefy, beautiful, wire-wrapped necklace and earrings from someone who presented them to me in a substantial, velvet-lined box. When I received them (after some custom changes), she gave them to me in a flimsy mesh bag. I paid close to $300 for the set, and felt slighted. I said something like, "Where's the nice box? ", and she got angry. I will never buy from that artist again, although I still love her stuff. Little things like this matter. 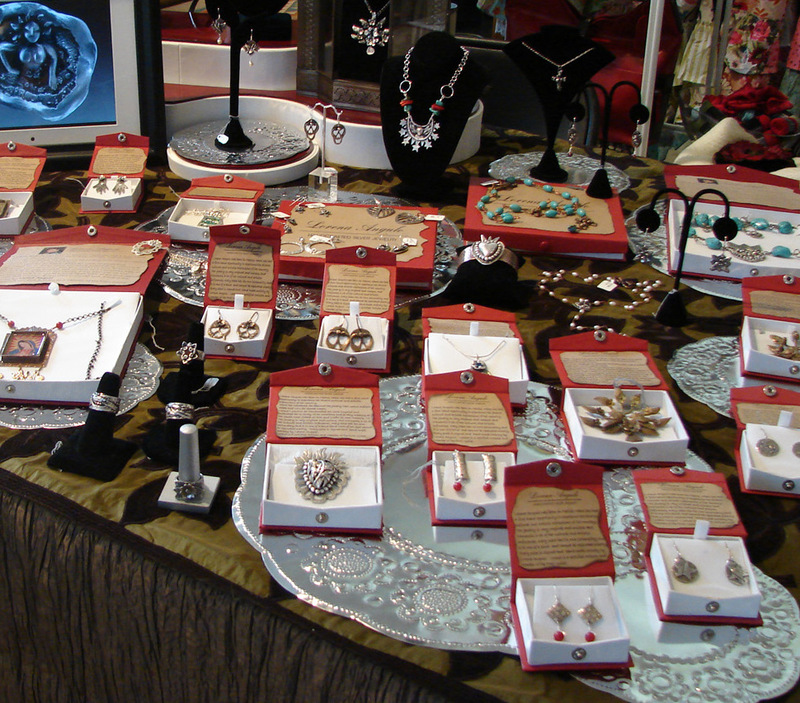 People (like me) often store their jewelry in boxes, rather than in one, large jewelry box. Thanks for being conscious of that. I am sorry for her that she has not noticed how important this is, not only for her but for her clients. Lore, loved this post, on my last fair, I received a comment from one costumer about appearance, she commented on how she liked a ring from a lady a couple of booths away from mine but she was a bit intimidated by her cleavage and wasn't sure if she was the artist or just someone selling stuff, when she left I kind of wondered how bad it could be and yes she was showing too much skin, and had a feather headpiece on the side of her head.. oh well, appearance can scare people away lesson learned..
Fairs are so much fun, and really the best way to sell jewelry is with you right there, showing your work with a smile like you said.. I'm off to share your post! Thanks, I am happy you lie the post. As you mentioned in your comment about this artist, it is very sad to see things like this because most of the time the artist is great but the first impression is important and we all need to be aware of that. Thank you, thank you, thank you for all of the advice!! I'm off to order some banners now. Yours are gorgeous! I did the inserts myself. Print them and glued them in my boxes. My boxes are made with recycled paper and I love them, that make a big difference in presenting my work to my clients and they love them. The earrings are really nice, some are quite ornate. You can really see the craftsmanship that goes into these pieces. Awesome post Lorena! Thank you for sharing your experience and insight with us. I hope to do my first show sometime this year and your post is full of fabulous advice!! Very good advices!! Here in Portugal, things are like the same, if the booth doesn't look nice we wont sale and people like us to talk to them and I may say that I, sometimes, sell things because I talk wiht my customers. Once again, thank you for your advices! Kisses! !